The aircraft was on a scheduled international flight from Beirut, Lebanon to Addis Ababa, Ethiopia, and crashed into the Mediterranean Sea shortly after takeoff. There were 82 passengers and eight crew members on board, all of whom were killed in the crash. The accident took place at about 2:30 in the morning local time and during heavy rain. A Lebanese government official listed the nationalities of the passengers as 51 Lebanese, 23 Ethiopians, two Britons, and one each from Iraq, Turkey, Syria, Canada, Russia, and France. Among the passengers was the wife of the French ambassador in Beirut. According to AirlinersGallery.com, the accident aircraft (ET-ANB) first flew in 2002 and was previously operated by Ryanair. 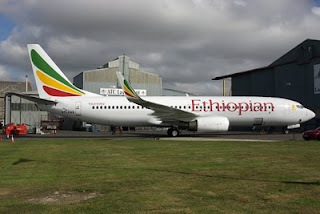 The aircraft was delivered to Ethiopian Airlines in September 2009. BBC reporter Uduak Amimo interview on the Focus on Africa program about what the mood was like in Addis Ababa, Ethiopia's capital the day of the crash. This is the third crash of an Ethiopian Airlines jet airliner that has resulted in the death of at least one passenger. The first was a September 1988 bird strike event involving a 737-200, and the most recent was a ditching of a 767-200 during a hijacking in 1996. This is the seventh crash involving a 737-800. The first was a September 2006 midair collision involving a Gol Linhas Aéreas 737-800 in Brazil that killed all six crew members and 148 passengers, and the most recent was the non-fatal runway overrun last month involving an American Airlines 737-800 in Jamaica. Three of the previous six crashes involved passenger fatalities. AirSafe.com will provide updates as information becomes available.